Geek Racks offers a collection of server containment options to benefit every business need from full server room supplies to small business operations. With a wide array of sizes and styles, there is a Geek Rack product made to hold and maintain a variety of equipment including DVR security systems, servers units and telecommunication devices. 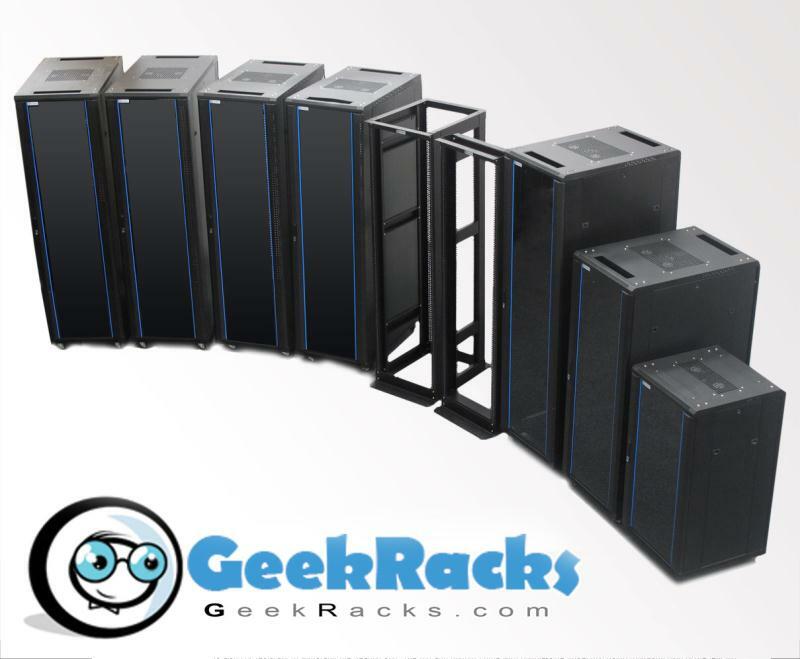 Review the different types of racks below to find out more on our full product line up and how this growing brand is emerging as a go-to name for server equipment storage needs. Geek Racks cabinets and wall mount units are EIA compliant and ready to fit standard sized servers including the most popular brands available on the market today. To provide years of use, the Geek Racks cabinet and wall mount server racks are constructed with quality materials: powder coated cold rolled steel, tempered glass and stainless steel hardware. Learn about our product line and the sizing/style options below available through select distributors. These traditional styled server racks come in large sizes up to 42U and are universal standard. Enclosed cabinets offer considerable vertical space, for future growth and can be locked for security purposes. These racks come in a slim design to fit in narrow spaces. Usage offers better air flow and easier access than the enclosed style yet with the same spacing needs. Swing-out wall mount racks allows the end user to easily access the back of the unit. Geek Racks swing out cabinets move a full 90 degrees from the wall significantly improving visibility/accessibility to cords, cables and equipment. Wall mount racks help save space, tucking into areas that normally wouldn’t work well for a full unit such as over an office desk or above security equipment. They work especially well for small companies starting out or larger companies looking for an easy addition to an existing system.